A few researchers want to place Placozoa (see Parazoa) among the Eumetazoa, and this link reflects that view. However, this requires the Placozoa to be a very simplified descendant of a much more complex ancestor, and the majority opinion seems to reject this. With that exception, this is a very complete overview of all animals more complex than the Parazoa. Since there's a lot of information here, I will deal with only the radially symmetrical Eumetazoa in this section and defer consideration of their more complex descendants for the sections which follow. "Coelenterata is an obsolete long term encompassing two animal phyla, the Ctenophora (comb jellies) and the Cnidaria (coral animals, true jellies, sea anemones, sea pens, and their allies) ... They have very simple tissue " organization, with only two layers of cells, external and internal." The hydra is capable of very active locomotion, but I don't seem to have a reference for it at the moment. Further study suggests that swimming originally evolved as an escape behavior and was only used later by the amphioxus as a means for making its breeding more efficient. "Diploblasty is a condition of the ovum in which there are two primary germ layers: the ectoderm and endoderm. Diploblastic organisms are organisms which evolve from such an ovum, and include cnidaria and ctenophora. The endoderm allows them to develop true tissue. This includes tissue associated with the gut and associated glands. The ectoderm on the other hand gives rise to the epidermis, the nervous tissue, and if present, nephridia. Simpler animals, such as sea sponges, have one germ layer and lack true tissue organisation. All the more complex animals (from flat worms to man) are triploblastic with three germ layers (a mesoderm as well as ectoderm and endoderm). The mesoderm allows them to develop true organs." This long article was one of the references to the Wiki article titled 'Radiata'. Although it was written in 1998 and does not include any genomic data, it was nevertheless quite interesting. However, it reaches no definite conclusions. "... cnidarian development often involves "chaotic" cleavage in which no two embryos in the same spawning will exhibit an identical cleavage pattern. ... In contrast to cnidarian development, ctenophores develop according to a highly stereotypic and phylogenetically unique cleavage program not shared by any other extant phylum ..."
Jelly fish, sea anemones and coral. "Their bodies consist of mesoglea, a non-living jelly-like substance, sandwiched between two layers of epithelium that are mostly one cell thick. They have two basic body forms: swimming medusae and sessile polyps, both of which are radially symmetrical with mouths surrounded by tentacles that bear cnidocytes. Both forms have a single orifice and body cavity that are used for digestion and respiration." Cnidarians and the evolutionary origin of the nervous system. "Cnidarians are widely regarded as one of the first organisms in animal evolution possessing a nervous system. Conventional histological and electrophysiological studies have revealed a considerable degree of complexity of the cnidarian nervous system. Thanks to expressed sequence tags and genome projects and the availability of functional assay systems in cnidarians, this simple nervous system is now genetically accessible and becomes particularly valuable for understanding the origin and evolution of the genetic control mechanisms underlying its development." Comb jellies. "Like cnidarians, their bodies consist of a mass of jelly with one layer of cells on the outside and another lining the internal cavity. In ctenophores these layers are two cells deep while those in cnidarians are only one cell deep. 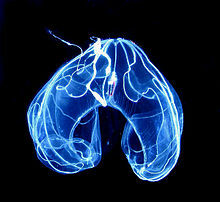 Ctenophores also resemble cnidarians in having a decentralized nerve net rather than a brain." Full length short article available online for free. What does this say about what the original animals looked like? For one, they almost certainly had a nervous system. Not only do ctenophores have nerves, but they have many of the same genes used to build a nervous system and keep it functioning. Many of those same genes are present in sponges, suggesting that these animals almost certainly lost the ability to make nerves somewhere in their evolutionary past. Meanwhile, the bilaterians elaborated the nervous system by adding dopamine signaling; all the genes for that are missing from Mnemiopsis." "The search for genes involved in development also shows that Mnemiopsis completely lacks three of the seven types of signaling networks that control the origin of complex tissues in bilaterians. Thus, a great deal of evolutionary innovation went on after the bilaterals split off from the rest of the animals. The new genome sticks a knife in the back of a nice, simple model, one in which animals evolved by steadily adding complexity to a simple ancestor. But in doing so, it provides a much clearer picture of what that ancestor probably looked like."